There's not much here in the way of story: a bunch of Teensies--tiny blue people with huge noses--have been kidnapped by nightmares come to life. Still, the minimal narrative is enough of a foundation to keep you moving from stage to stage. There are multiple worlds to take on, each with a dozen or more themed levels full of collectible Lums and hidden Teensies to save. In addition to these, you'll find daily and weekly challenges tied to online leaderboards, tons of characters to unlock, and an immensely addictive soccer mini-game that will siphon hours of your life without you even knowing--and if all that wasn't enough, a sizable number of remastered stages from Rayman Origins are ready to be discovered all over again. At first, you'll be overwhelmed by how much there is to do, and Legends' initially-confusing interface doesn't really help you parse through that barrage of information. Frequent pop-up notifications try to pull you in a dozen directions at once, urging you to check out everything on offer without establishing what is and is not a part of the "main" game. It takes awhile to get your bearings, but you'll be blown away by the sheer variety of content once you do. So, how does the next-gen version of Rayman Legends compare to its last-gen counterpart? Actually, the two are nearly identical. Playing on the PS4 / Xbox One has a slight advantage, as these versions are marginally prettier than last year's PS3 and Xbox 360 releases and have no load times when transitioning into a new level. PS4 players can also use the controller's touchpad to pause the game, swipe around the screen, and snap a screenshot at anytime. Revolutionary? No, but pretty cool nonetheless. That impressive variety even extends to the level design. It's not uncommon to eat your way through stages made entirely of cake in the food-themed levels of Fiesta de los Muertos. In 20,000 Lums Under the Sea, you'll have to swim through treacherous underwater grottos, avoiding the ever-searching spotlight of enemies to the backdrop of a music track that will instantly remind you of the famous theme from James Bond films. Each level is a visual delight brought to life by a wonderful attention to detail and an accompanying soundtrack that reflects its theme. It's almost impossible not to spend at least a little bit of time just staring in awe at the hand-drawn backgrounds, or the goofy creatures that inhabit each location. What's more, every single stage is challenging in its own way. Some are more about exploring at your own pace, where the difficulty lies in seeking out every hidden secret; others will test your twitch reaction skills as you sprint and jump from platform to platform while a wall of fire races to catch you. Best of all, each world wraps up with a stage that plays a spoof of a popular song (think Black Betty, but with monster grunts in place of lyrics). Here, success relies on your ability to jump and kick to the beat of the music. You'll encounter a little bit of all of these things within each world, preventing Legends' numerous levels from ever feeling too much alike. There's just one thing that occasionally interrupts the excellent pace that pervades the entire game: a little green fairy named Murfy. Murfy is an AI-controlled character that shows up in about half of the levels. Only with his help can you move certain platforms, or, say, stop a stream of fireballs from impeding your progress. In all but the Wii U and PlayStation Vita versions of the game, Murfy moves on his own accord, hovering above objects that he can manipulate. With the quick tap of a button, he'll do his thing and hover along until he's needed. At best, Murfy adds a minor but noticeable layer of challenge to the platforming experience; at worst, he's an unnecessary complication in already-fast-paced levels. If you're playing on Wii U or Vita, however, the action is jarringly interrupted once he appears on-screen. You'll be forced to take control of Murfy even when playing solo, while an AI-controlled Rayman (or his friend Globox) runs along the level as you sit there and swipe at platforms, watching the computer have all the fun. Being forced to play as Murfy without even the option to revert control back to Rayman is shockingly bizarre and disappointing, especially considering Legends was initially built as a Wii U exclusive--instead, that version ends up being the least enjoyable way to play it. Murfy does, however, make a good fit for less-skilled players who still want to join in on the fun without having to worry about precision jumping. But for those looking for a more intense multiplayer experience, up to four players (five on the Wii U) can join in the fray at once. Unfortunately, Legends faces many of the same cooperative challenges of its 2D-platformer brethren. Adding another player into the mix is genuinely enjoyable and a totally viable way to play through the game. But once you get three or four players competing for collectibles and slapping each other to their deaths, everything devolves into utter chaos, and it's extremely difficult to keep track of your character on the screen. That's not to say playing this way doesn't make for some mindless fun, just don't expect smooth sailing. Even after ten hours of play, you'll have a wealth of content just waiting to be unlocked, pushing you to revisit already-completed stages or tackle challenges you'd passed up entirely. Rayman Legends is easily one of the most feature-rich platformers you'll likely see, rife with accessibility and challenge in equal measure. By a few hours in, you'll have exhausted every synonym you know for "pretty." A few stages after that, "fun." And by the end, just one word will accurately describe the whole experience: "fantastic." Is it worth shelling out the cash for the next-gen version if you fell in love with last year's release? I suppose if you're desperate for something to play and have been itching to save Teensies all over again. 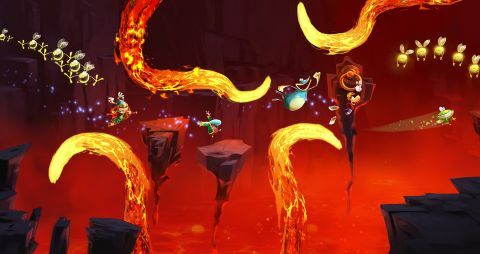 But for most Rayman veterans, the PS4 and Xbox One version of Legends offers little incentive to return. For those who missed out the first time around, however, this is a no brainer--one that deserves your attention immediately. One of 2013's greatest platformers is at its best on the PS4 and Xbox One. Those who have already completed a playthrough have little incentive to return, but it's a great value for anyone who hasn't. This game was reviewed on PS3, Wii U, and PS4. Description Another vibrant platformer game in the Rayman series.